Manhattan Towing Service Open 24 7! Car Towing Manhattan offers tow truck services for cars, motorcycles and medium sized vans. 24 Hours Towing Manhattan NYC offers affordable flat rate prices, with quick response times of 15 minutes to an hour or less in most cases. Car Towing Manhattan can only change a spare tire for you if you have one. If your tire is damaged beyond repair the only thing we can do is tow your vehicle to the closest tire shop for fixing. Car Towing Manhattan offer the cheapest car lockout prices in the whole of metro Manhattan. We take extra care to make sure that all cars are not damaged in the process of unlocking the doors. Car Towing Manhattan offers battery jumpstarts for all makes and models of cars including hybrid vehicles, suv's, mini vans and all light duty box trucks. We are open also on holidays and weekends. Nothing's worse than having your car break down in the middle of the road. Unless, of course, it's in the middle of the night, and raining. Thankfully, help is only a phone call away. 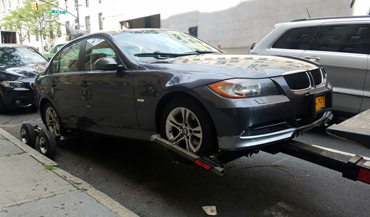 Car Towing Manhattan is a full-service towing company offering emergency roadside assistance and towing services 24 hours a day, 7 days a week. Family-owned-and-operated since 2008, Car Towing Manhattan Inc., Towing Service offers a level of personalized and professional service you won't find anywhere else. Local Discount Towing, Flat Tire Change, Car Door Unlocking Services and Auto Battery Jumpstart Technicians Available 24 7.